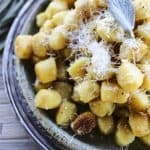 Tender Garlic Butter Gnocchi crisped in garlic and sage infused butter with a generous amount of melted Parmesan cheese clinging to it. In a large, heavy-bottomed non-stick skillet, melt the butter over low heat. Add the lightly smashed garlic cloves, smack and scrunch the sage leaves a few times, then add those to the melted butter and swirl. Leave the pan over low heat, swirling occasionally. While the garlic and sage infuse the butter, bring a large pot of water to a hard boil. Salt the water, then cook the gnocchi according to package directions. Drain. Use tongs to remove the garlic and sage leaves from the butter and raise the heat under the pan to medium high. Add in the gnocchi and toss to coat all of the gnocchi with the garlic butter. Tear up the remaining sage leaf and toss the contents of the pan again. Let the gnocchi rest for a couple of minutes, sizzling, until the bottoms of the gnocchi are golden brown. Stir the pan and let it rest again, sizzling, until the next side is golden brown. Repeat twice more. Grind a generous portion of black pepper over the gnocchi, toss in 1 2/3 cups of the grated cheese and stir to melt. Remove from the heat, transfer to a serving dish, and top with the remaining cheese. Serve hot.